Recently, Mark e-mailed me an article from a 1955 Good Housekeeping magazine entitled "The Good Wife's Guide". (He better have been joking!). 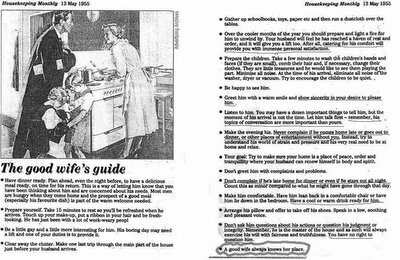 While I am certainly not a feminist or progressivist, all I can say is, I'm glad things have changed. For a better view, just click on the article. Note: Underlines, circles, and/or other emphasis are not mine!